It is normal to feel nervous or slightly scared when faced with an unfamiliar or pressurized situation, but for some people, these emotions feel extreme and prompt a range of emotional and physical symptoms over which the sufferer has no control. In somebody suffering from social anxiety, the anxious feelings can be triggered by situations or events that non-sufferers would consider to be trivial. 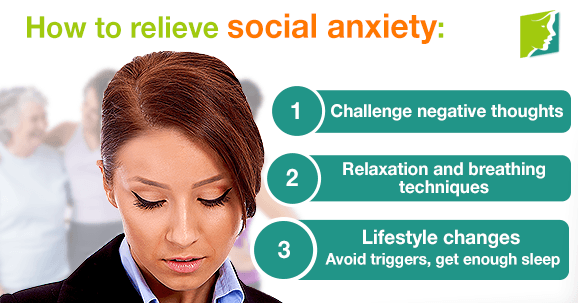 Read on for more information about social anxiety disorder and helpful tips about how to relieve it. Social anxiety disorder, or social phobia, is an overwhelming fear of social situations, with the sufferer often feeling as though they are being constantly judged, watched, and negatively evaluated. In the most severe cases, a person will go to great lengths to avoid being around other people, and this obviously has a negative effect on relationships and social life. The excessive worry that comes with the thought of going to a social gathering. Symptoms of social phobia include shaky voice, rapid heartbeat, and intense sweating. The negative though processes that accompany social anxiety disorder need to be reversed if the disorder is to be prevented from getting the better of you, and this takes a little bit of effort. It is a good idea to get into the habit of recognizing the negative thoughts when they arise and replacing them with positive ones. It can be helpful to imagine the words you would give a friend who told you she was feeling this way - the chances are they would be far kinder and more encouraging. After a while, this positive mindset will become routine. Elevated blood levels and rapid heartbeat will induce or worsen a sense of panic, and this can lead to the intense fear of social situations that a sufferer of social anxiety will experience. Taking a few minutes a day to practice some relaxation and breathing techniques should reduce social anxiety in the long term and leave you better equipped to use them when you feel an attack striking. Avoid or limit caffeine. It is a stimulant that worsens certain anxiety symptoms, such as rapid heartbeat. Avoid alcohol. It is a depressant and will lower your mood, leaving you more vulnerable to irrational thoughts. Get enough sleep. Good rest will help you stay calm in social situations. Social anxiety is not easy to cure, but with a bit of effort and diligence, it should become easier to manage. Part of the solution is talking to someone about your efforts. This should provide you with a feeling of support, and the chosen person will be able to help you stay on track. Read more on do's and don'ts of social anxiety.